We're excited to report that Lange Production is re-issuing this brilliant chair designed by the late Danish furniture designer Grete Jalk. 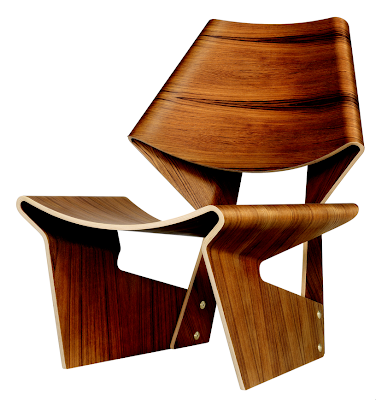 Known as the GJ chair, this molded plywood masterpiece was first introduced in 1963 at the Daily Mail International Furniture competition. Jalk won the British competition and later that year the Museum of Modern Art bought the chair where it's remained in their permanent collection ever since. Due to the complexity of the design, only around 300 copies were originally produced and only a few of those remain in existence today. Lange Production has chosen to launch the furniture in their original wood species, Teak and Oregon Pine, and have added a new black stained ash model. 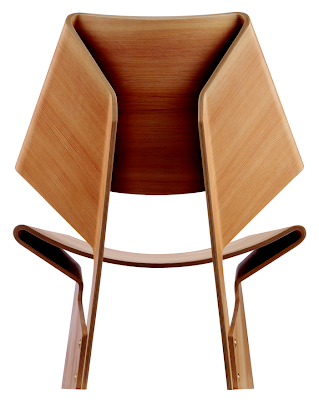 You can find the chair here in the States at Suite New York. We've included a slideshow to highlight more of Jalk's incredible designs, but to see more of her work as well as other Danish Modern masterpieces you should definitely click here to order the new beautifully photographed book by Andrew Hollingsworth. I don't think a re-issue devalues the original. The original is the original, and they are re-issuing, not reproducing. as long as the reissue holds to the same standards as the original, I think it's a way to make the piece more available. Of course people with originals might not be too happy. I agree. It's sort of like a tribute albums for one of the greats, like Cat Power singing Johnny Cash. Or come to think of it, more like if there were only four copies of the Ode to Joy on LP and then someone released a few hundred copies on CD. Good design, like good music, is meant to be used and enjoyed. It takes nothing away from the worth of the original and gives more people the ability to have something of great beauty and function in their lives. It's not the Mona Lisa, it's a chair. A work of art, definitely, but meant to bring aesthetic pleasure to living, not just put up on a pedestal of posterity. Coach Madison Handbags and Coach Poppy Bags are viewed among probably the most newsworthy among the particular Coach bags so far. You might have seen plenty of greatest quality bags into your entire life span but when it comes to the coach outlet store online they are remarkably efficient, versatile and carved bags beyond your imaginations. Different style bags from Coach Outlet Store are always eloquent statement outside a woman's attitude towards life and career. Thus, women's bag, must exchange the use of occasions, so they are not the same as showing different spatial and temporal rhythm of beauty. What a unique idea and design of chair. Its looking so beautiful. New ideas always welcome. You know... hard work plus good thinking always bring very good results. and your chair's design is looking awesome and unique.